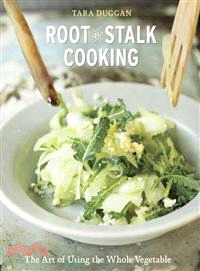 Focusing on the overlooked parts of vegetables, including stalks, tops, fronds and stems, this innovative cookbook reveals a whole new world of flavors while reducing waste and saving money through 70 recipes that teach home cooks how to think differently about the produce they buy and grow. Original. TARA DUGGAN is a staff writer for the San Francisco Chronicle’s Food & Wine section and the author of three previous cookbooks, including The Blue Bottle Craft of Coffee and The Working Cook. A graduate of the California Culinary Academy, she is the recipient of a James Beard Foundation Journalism Award. Her writing has appeared in The New York Times, The Denver Post, The Chicago Tribune, and The Toronto Star. Tara, her husband, and their two daughters live in San Francisco and enjoy spending time on her family’s off-the-grid farm in Northern California, where she gets ideas for what to do with all kinds of kitchen scraps.